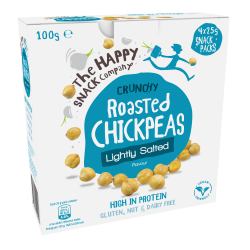 The Happy Snack Company believe that healthy snacking shouldn't be boring, and their main priority is to make other people feel good about the snacks they eat. 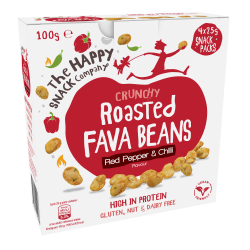 They take sustainably grown chickpeas and fava beans then roast and season to create snacks which are munchably wholesome and satisfy your hunger cravings in a healthier way. Their products are naturally high in protein and fibre, lower in fat than other snacks such as nuts, and free from gluten, nuts, eggs and dairy. The perfect tasty choice for a healthy wholefood snack, something to fuel the school day, or for people managing food allergies. 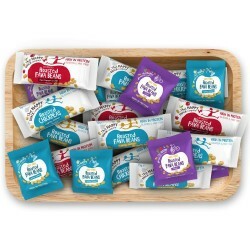 The Happy Snack Company have won numerous awards such as Best Allergy Friendly Snack and Best Kids Lunchbox Snack from the Australian Healthy Food Guide Awards, Winner of the Cracker & Snack Category at the New Zealand Healthy Food Guide Awards, and Best New Gluten Free Snack from the Melbourne Gluten Free Expo.